We have special offers available on tickets for Horrible Histories: Barmy Britain - Part Three. 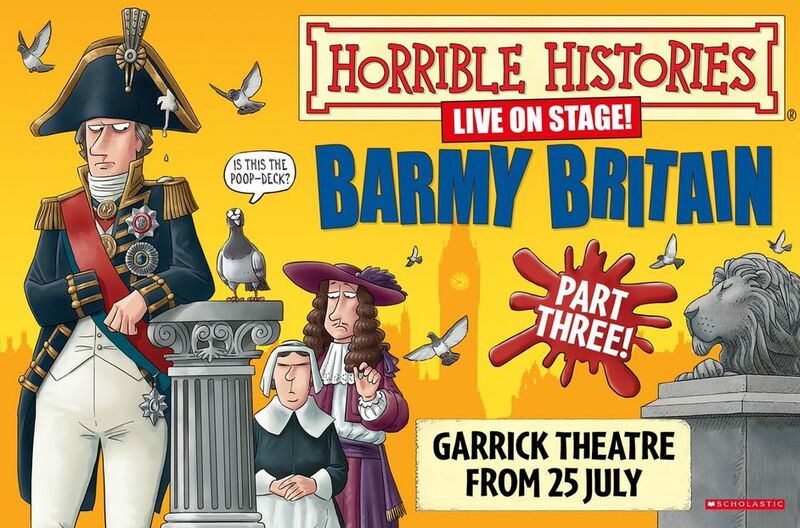 We've had great, gory fun with Horrible Histories - Barmy Britain Parts One & Two, but now the Birmingham Stage Company returns to the Garrick Theatre with the brand new Horrible Histories - Barmy Britain - Part Three. Terry Deary and Neal Foster, co-authors of the bestselling Horrible Histories books, bring the barmiest bits of British history to the stage, including a special sketch with King John to celebrate the 800th year of the signing of the Magna Carta. The Great Fire of London, crazy King Charles, Admiral Nelson, the Duke of Wellington, the vile Victorians and the First World War all get the Horrible History treatment. What are the best dining options near Horrible Histories: Barmy Britain - Part Three London? Horrible Histories: Barmy Britain - Part Three gyms, sporting activities, health & beauty and fitness. The best pubs near London Horrible Histories: Barmy Britain - Part Three. Horrible Histories: Barmy Britain - Part Three clubs, bars, cabaret nights, casinos and interesting nightlife. Where to have your meeting, conference, exhibition, private dining or training course near Horrible Histories: Barmy Britain - Part Three. From cheap budget places to stay to luxury 5 star hotels see our deals for Garrick Theatre hotels, including St Martins Lane, A Morgans Original from 83% off.